There is a primary coming up here in Virginia. On June 10 you and I will decide who we want to be our Congressional representative from the 7th district going forward. Our sitting Congressman, one Eric Ivan Cantor, is being challenged by a college economics professor (Good, we need someone who understands economics), David Brat. Given recent events in the 7th district there are many who feel that Brat has a real chance to unseat Cantor. We shall see. In the meantime there have been speeches, news articles/TV reports, blogs, protests, Facebook posts, and a plethora of mailers (Most from the Cantor camp), telling us who we should vote for and why. To say that the Cantor camp has been relying on deception and lies would be an understatement, in my humble opinion, but then there are those who disagree with my assessment and have taken me to task for it. Certain Republican Committee Facebook pages in the 7th district have banned me and others from posting on them. What offense did I commit? Did I use foul language, that would elicit a gasp of dismay from the more sensitive readers of the page? Did I post ridiculously inaccurate ramblings about Cantor or Brat? Did I call people who disagreed with me bad names? Nope, none of the above. I simply had the nerve, the unmitigated gall to post examples of Eric Cantor's voting record in an effort to point out how he was anything but a conservative. Well, we can't have that. Cantor and his camp tell us that I, Brat, and others are lying when we say that Cantor is for amnesty for illegal aliens. They say we are wrong when we call out Cantor for altering the STOCK Act to allow family of Congress members to continue to trade illegally on the stock market. OK, let's continue to the end here and see and hear from Cantor himself. In challenging me, and others, regarding my posts, I have been accused of posting "allegations, assertions, slander, and innuendo" about Cantor. Again, all I have done is post examples of his voting record, but I suppose if that is damaging to someones assessment of the representative then of course they will say I am wrong. If I am wrong then the Library of Congress is wrong. VoteSmart.org is wrong. OpenSecrets.org is wrong. Well, you get the picture. There are many sites one can go to and look at Cantor's voting record for themselves, but one must be desirous of the truth. Alas, I can only hope that some of them may yet come around to that way of thinking. What is truly sad is that those who revile me for pointing these things out could have done this research themselves, if the truth actually mattered to them. The average voter could do the same research if they weren't, apparently, so lazy and willing to just believe whatever the party tells them. But if I can help reach one or two heretofore uneducated voters then I will consider my efforts worth it. In many of my posts I ask those who disagree with me to prove me wrong. I challenge them to "look it up" themselves and tell me where I got it wrong. I have yet to receive any correction of my posts. What I have received is the usual name-calling, total disregard for the truth, and in some cases, being banned from their pages. I guess the truth is not really wanted by some among us. In my continuing effort to educate the voters, or as many as I can, in the 7th district, and to simply encourage critical thinking, I am including links to examples of Cantor's actions/words. I am not the only one who feels Cantor has forsaken the Republican Party Creed or his oath to the Constitution. Also, consider that the sources I cite have been used by the same people who now rail against me, when it suited their purposes. You will note, particularly in the video clips, that you will hear Cantor's own words. Listen to them and then compare them to his subsequent actions. You be the judge. Eric Cantor - The New Mr. Amnesty? This is by no means a comprehensive listing. There is much more to see, hear, and read. Please avail yourselves of the opportunity to do your own home work. 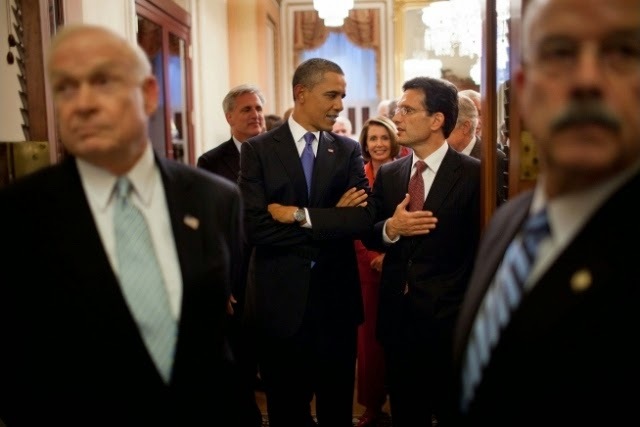 You will find that Eric Cantor is not the man he claims to be.